J-Live, one of the most talented emcees the underground has seen. The man started out as a middle school English teacher; it was only when this album finally hit shelves in 2001 after drawn out troubles with two different record labels that he was able to focus on rhyming full time. From then on, J-Live has come with consistently tight records, and he's known as one of the best in the highly competitive world of conscious rap. One listen to this, his first studio album, blasts away all question. 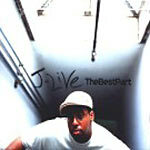 ''The Best Part'' showcases J-Live's talents over beats from the hottest producers out there: Primo, Pete Rock, and Prince Paul all contribute. His academic background means you're in store for the best in clever wordplay, and as always J comes packed with rhymes that uniquely delve into intelligent subject matter, like ''Vampire Hunter J,'' an attack on the heartless and greedy side of government, and banger ''R.A.G.E.,'' a declaration of J's anger about the state of the black community. The re-issued 2xLP comes with a free mixtape, ''The Rest of J-Live'' (as a download). Production by 88 Keys (tracks 3, 4, 17); Grap Luva (5, 7); Emmai Alaquiva (6); Pete Rock (8); Prince Paul (9); DMS Country (10, 11, 12); DJ Spinna (13, 14); DJ Premier (16); and J-Live (19).